Cheer Amusement puts high priority on children’s safety. We maintain a continuous and proactive approach to ensure we meet and exceed all North American and European standards, including the TUV, GS-EN1176, CE for Europe and ASTM, CPSIA, UL94, NFPA701 for Northern America, for our indoor playground systems. 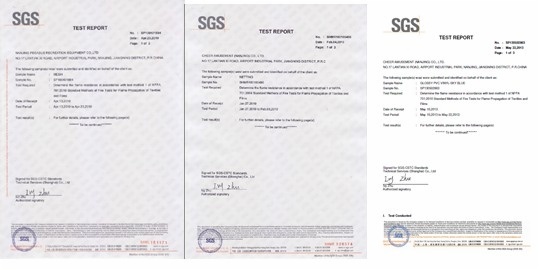 So far, Cheer Amusement is the first indoor playground manufacturer in China to receive the GS-EN1176 certificate for indoor playgrounds. ASTM International, known until 2001 as the American Society for Testing and Materials (ASTM), is an international standards organization that develops and publishes voluntary consensus technical standards for a wide range of materials, products, systems, and service. Our indoor playgrounds are specifically designed, manufactured and installed in accordance with the ASTM F1918 (Standard Safety Performance Specification for Soft Contained Play Equipment). This range of users encompassed by this safety performance specification is the 5 percentile 2 year old to the 95 percentile 12 year old. We have exported a significant amount of indoor playgrounds to North America and our indoor playgrounds met the local safety standards and passed the safety inspections. The Consumer Products Safety Improvement Act (CPSIA) of 2008 is a United States law signed on August 14, 2008 by President George Bush. The legislative bill was known as HR4040, sponsored by Congressman Bobby rush. It was approved by both the United States House of Representatives and Senate. It imposes new requirements on manufacturers of apparel, shoes, personal care products, accessories and jewelry, home furnishings, bedding, toys, electronics and video games, books, school supplies, educational materials and science kits. Laws for children safety are very strict in USA and the safety standards for indoor playgrounds are also very high. To meet the safety law requirements and high-quality safety standards, our indoor playgrounds and equipments are specifically designed, manufactured and installed in compliance with those laws and standards in every aspect. NFPA 701 is a standard of the National Fire Protection Association. It was made for testing the flame resistance of fireproof materials such as building materials, outdoor shelters (like canvas, tents), fabrics, curtains, vinyl-coated fabrics and other materials applied to window materials. All of the materials used for our indoor playgrounds and equipment, which are specifically manufactured for the NFPA 701, have been tested and proven to pass the NFPA tests and meet its standards. As a result, our materials used for indoor playgrounds are professional and safe for customers to operate it safely and successfully. UL-94, the Standard for Safety of Flammability of Plastic Materials for Part in Devices and Appliance testing is a plastic flammability standard released by underwriters Laboratories of the USA. The standard classifies plastics according to how they burn in various orientations and rank their thicknesses from lowest (least flame-retardant) to highest (most flame-retardant). In addition to NFPA 701, our indoor playgrounds and equipment also meet the requirements and standards of the UL-94. The plastic materials we use are specifically tested and proved to be qualified; We have tested a great amount of our samples in various orientations and thickness, and all of the samples tested proved that our plastic materials meet the UL-94 standards in every aspect. 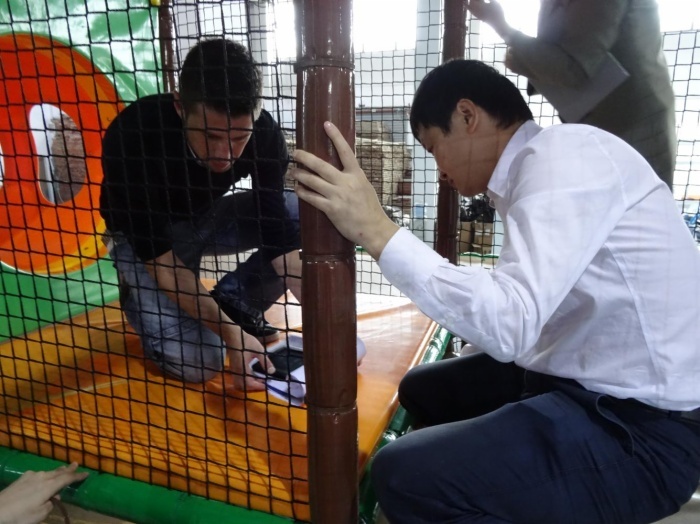 Thus we can assure our plastic materials are very safe for indoor playground use. The EN1176-10 is a European safety standard set for the safety of indoor playgrounds and outdoor playgrounds and includes general safety requirements and test methods for playground equipment. European countries use it as a reference of international safety standards for indoor and outdoor playgrounds. We have been in business with many customers from European countries for many years. Our indoor playgrounds are proved to meet the EN1176-10 standards which many customers from European countries refer to as a crucial international safety standard. The EN1176-1 is a European safety standard set that specifically focuses on the general safety requirement and test methods for playground equipment and surfaces. The EN1176-3 is a European safety standard set that specifically focuses on additional specific safety requirements and test methods for slides. EN71 is another safety standard widely implemented in Europe and which our indoor playgrounds standards meet. 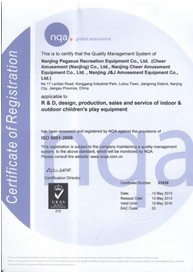 Any indoor playground manufacturer should meet the requirements of this standard. CE mark is a safety certification mark and serves as a passport to enter into the European market. CE stands for CONFORMITE EUROPEENNE. 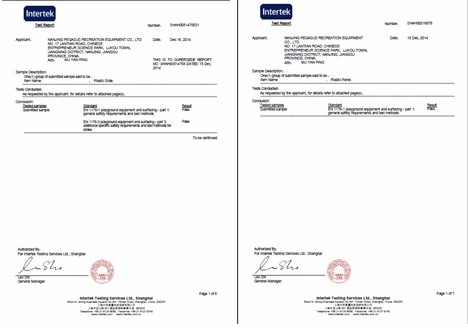 It is a compulsory certificate mark and all the products produced by Europe Union inner enterprises or enterprises from other countries should label the CE mark to prove that their products meet the basic requirements of the EU instruction of Technical Coordination and New Standardization Methods to circulate their products in EU market. CE is an very important safety standard in Europe, all the indoor playgrounds should meet the CE standard if they want to enter into the European market. 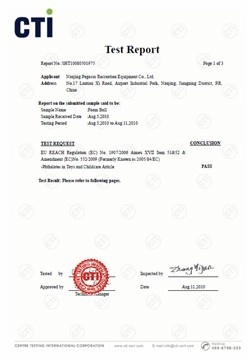 As a professional indoor playground exporter, we have long-term cooperation with our European customers and our indoor playgrounds exported to Europe meet the CE standard and pass its inspection. EU REACH Regulation (EC) No. 1907/2006 is a safety certification for Non Phthalates in Toys and Childcare Article. 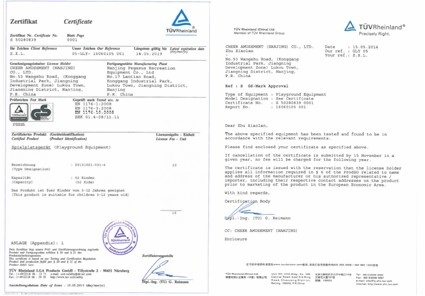 We strictly ensure to follow the standards in the AS 3533.4.2-2013 document in our designing, manufacturing process. The CSA Z614-07(R2012) is a safety standard made by Canada for indoor and outdoor playgrounds. This is the safety standard that is commonly referred by our Canadian customers. Thus, we ensure that our indoor playgrounds are fully in compliance with this standard. In order to conform to the requirements of CSAZ614-07(R2012), our indoor playgrounds exported to Canada are all designed, manufactured and installed in compliance with the CSAZ614-07(2012) standards. Thus our indoor playgrounds meet the requirements of the CSAZ614-07(2012) standards and pass all the local safety inspections. ISO, the International Organization for Standardization, is an independent, non-governmental organization. It is the world’s largest developer of voluntary international standards and facilitates world trade by providing common standards between nations. Nearly twenty thousand standards have been set from manufactured products and technology to food safety, agriculture and healthcare. The ISO standard is one of the most implemented international safety standards as almost every country accepts it. Our indoor playgrounds also meet the requirements of ISO standard in every aspect. 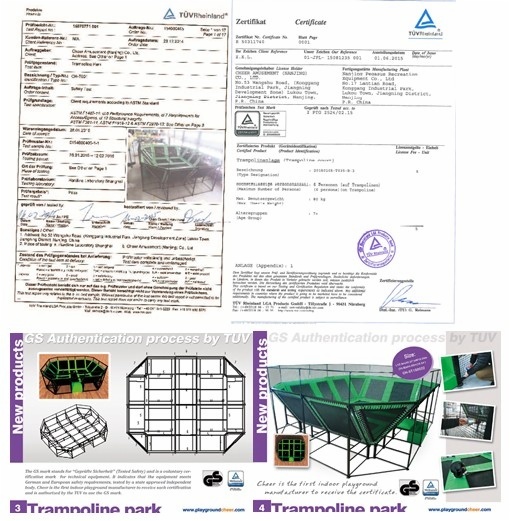 Cheer is the first and only supplier in China who has both the TUV and ASTM certificates for trampoline parks. 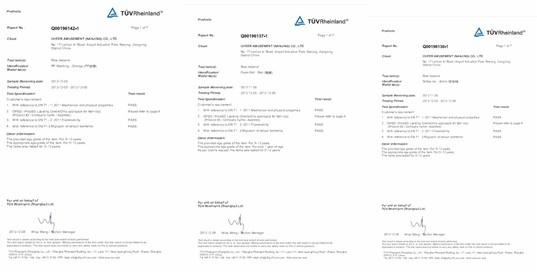 Our trampoline park materials have passed all the tests by TUV Rheinland, such as EN71-1 Mechanical and physical properties, EN71-2:2011 Flammability, EN71-3:2013 Migration of 19 Elements, and tested according to ASYM standards such as ASTM F 1478-11 Performance Requirements and Structural Interity, as well as the ASTM F381-14, ASTM F1918-12 and ASTM F2970-13 and so on.